Budapest is a great destination for budget travellers, with both historical sights and a lively cosmopolitan vibe. 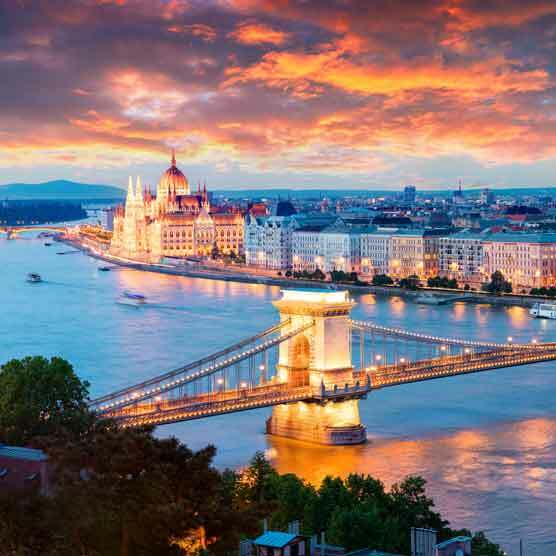 We've highlighted 7 things to do in Budapest under €30, from drinking at ruin pubs to spending time at Margaret Island and taking a dip in the famous Thermal Baths! Plus, if you're looking for somewhere to stay for low costs too, our line-up of the best hotels in Budapest are sure to fit the bill. All you need is fare for the bus or ferry to reach tranquil Margaret Island, sitting pretty between Buda and Pest on the Danube. It’s a car-free zone, so you’re free to roam the park’s 2.5km stretch, read a book in a quiet corner or listen to the musical fountain as it belts out classical and pop tunes. You can also cool off at the Palatinus Baths, an open-air waterpark where the kids will love riding the giant slides for less than €7. It doesn’t get more retro than this - think abandoned factories, buildings and houses, boasting eclectic art, mismatched furniture and walls covered with graffiti - that's a ruin pub. Mostly found in the Jewish quarter, the conversation flows easy and the beer is cheap. The popular ruin bars include the iconic Szimpla Kert, which figures on our list of the world's best cocktail bars, besides Instant and Fogasház. Take a stroll along the Liberty Bridge to Buda, which leads the way to all the top sights, such as the Royal Palace, Matthias Church, Fishermen’s Bastion and the Gellert Baths. Pause at the century-old Fishermen’s Bastion on Castle Hill to admire the seven distinctive white turrets and look out at the flowing Danube from its lower balconies - all for free. You’ll find the Great Market on the Pest end of Liberty Bridge, a smorgasbord of colours, flavours and scents. Built in the late 19th century, the covered halls extend three floors, where you can pick up salamis, sausages, paprika, traditional treats like lángos and Hungarian wines, besides souvenirs to bring back home. Down in the basement, you’ll find fishmongers and a sports store too. It’s a grand sight from the outside, with gorgeous Zsolnay tiles covering its giant roof. You can’t leave this stunning city without visiting Budapest's famous thermal baths. A massage can set you back a little under €40, but if it’s a tour you’re after, it’s well within your budget. The Szechenyi Baths, built in 1913, are the most popular, hosting 18 pools, saunas and steam cabins offering a host of massage therapies - plus you can grab an online entry ticket for €18. There’s also the beautiful Gellert Baths, Kiraly Bath, affordable Veli Bej and Lukacs, a popular spot among the locals - so go on, dive in! Budapest’s most famous street, Váci Utca is a revelation sprinkled with restaurants, wine shops, cafes and bars. Wander the buzzing street for a slice of city atmosphere, and head to nearby Central Market Hall, where you can buy fresh produce as well as shop for handcrafted souvenirs. Running parallel to the Danube, you can navigate the quaint alleyways and make your way to the twinkling riverfront. Don’t forget to pose for a photo at Building no.9, the site of Mozart’s first concert, at age 11. Discover the Jewish Quarter, where lively ruin bars rub shoulders with ancient and religious wonders. Rich in history and tradition, go on a free walking tour starting at one of the largest synanogues in Europe, admire the Tree of Life Holocaust memorial located in the Raoul Wallenberg Memorial Park and get a taste for Hungarian cuisine at the Szimpla Sunday Farner's Market.